A research article titled “Computational Fluid Dynamics Simulation of Multiphase Flow in Structured Packings” showed that as a volume of fluid multiphase model was utilized to scrutinize the effective area and created liquid film in the structured packings. The computational results showed that the gas and liquid rate play important roles in the effective interfacial area of packing. This effective area increases as the flow rates of both phases increase. Lot of emphasis was given to the process of liquid film formation in both 3D and 3D models. This case study explores how CFD can be used as an effective tool to predict information pertaining to the details of gas and liquid flows in gas scrubbing application. A leading environmental systems solution provider specialized in designing and manufacturing of the equipment for environmental systems wanted to ascertain the spray angle of nozzle and verify that it meets the required range of 15º-20º based on the process conditions. The client had a major understanding about water and that was the basic reason that their products and services are utilized across the globe. From filtration and disinfection equipment to contract operations, their water treatment technologies and services assist in protecting and preserving the world’s most precious resource. The company can work with you to solve individual plant operations issues or provide entire water and wastewater collection systems with the full range of plant and system operation, maintenance and preventative maintenance. It is the one company with the breadth and diversity to understand and address all your water and wastewater treatment needs. The goal of the client was to ascertain the spray angle of the nozzle and verify that it meets a required range of 15º-20º based on the process conditions. But for that to be done it was important to understand that due to high competition in the market, the customer satisfaction expectations are always high in terms of Delivery which in turn demands for shorter Design Cycles. Providing a solution to one of the top environmental systems service provider was one of the critical requirements due to high severity level of the domain. With all these expectations, it became very essential to focus on designs which can be readily used with fewer number of prototype testing. After gauging the requirements of the client; Hi-Tech CAE utilized ANSYS Fluent v14.0 for successful execution of the CFD project. Hi-Tech CFD utilized ANSYS Fluent v14.0 software to perform multiphase flow analysis for the CFD project. The model design and geometry was conducted utilizing ANSYS DesignModeler software. A detailed three dimensional CFD model was constructed for the prediction of flow behavior of spray nozzle design. 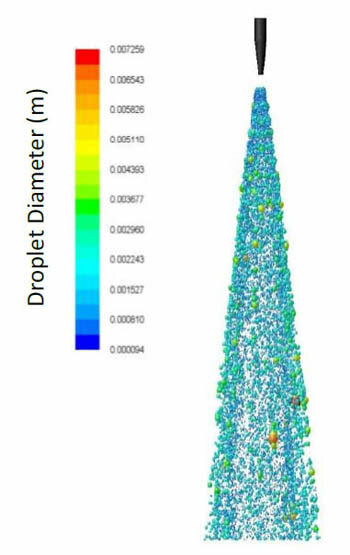 The analysis was performed to determine the droplet diameter size and distribution for the newly designed spray nozzle. The objective was to find out the Sauter mean diameter (S32) of the spray nozzle. Based on the CFD results, the nozzle exit effective angle (measured from the center-point) was 20.28 degrees. By the time the flow covered 189.438” axially to reach the venture throat; it would have spread across 67.761. With the help of CFD analysis results it was possible to predict the flow behavior of spray nozzle design. It helped in comprehending the droplet diameter distribution at different planes in the direction of flow. Calculation through CFD methodology abridged the design cycle as it was made sure by CFD calculations that the design was performed as per the requisite stipulations.